Popular red bird takes on biggest role of all, Luke Skywalker. Meanwhile, Death Star Jenga comes with exclusive Chewbacca figurine. Tomorrow, October 8, both Rovio Entertainment and Lucasfilm will unveil a promising Angry Birds meets Star Wars toy line. The announcement will take place at 10:00AM ET in Times Square, New York City, though Rovio encourages fans to get there at 8:00AM ET for some unknown reason. Among the products? 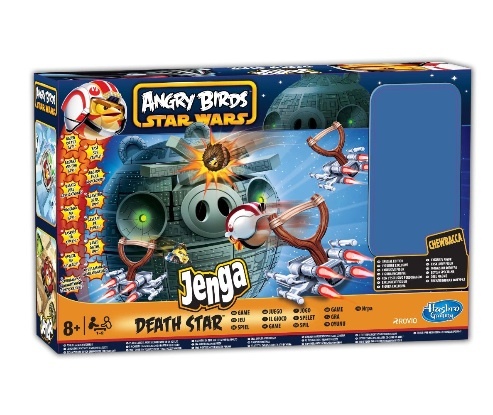 A Star Wars themed Angry Birds Jenga Death Star, which you can see here. This will also tie into an Angry Birds Star Wars video game, presumably for iOS and Android. All we know, for now, is that the red bird will be Luke Skywalker. That said, it's a safe bet those rascally green piggies will dress up as Stormtroopers and Darth Vader. Have to admit, this could be an excellent partnership. We can already imagine backgrounds taking place on Tatooine and Hoth.